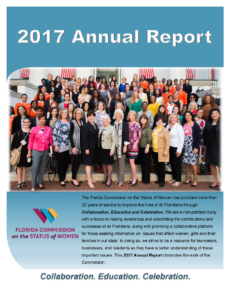 Tallahassee, FL (January 1, 2018) — The Florida Commission on the Status of Women, is pleased to present its 2017 Annual Report, highlighting our program of work in 2017 through collaboration, education and celebration, and laying the groundwork for Commission initiatives for 2018. Our goal will continue to be focused on reaching out across the State and providing connections among the hundreds of organizations working in all 67 counties that are focused on the welfare of the women of Florida. We are all interested in improving the well-being of Florida women and girls – and by extension, all Floridians. In doing so, we strive to be a resource for lawmakers, businesses, and residents so they have a better understanding of these important issues. We also extend our gratitude to Governor Rick Scott, Attorney General Pam Bondi, Chief Financial Officer Jimmy Patronis, Agricultural Commissioner Adam Putnam, Speaker of the House Richard Corcoran and Senate President Joe Negron, for their continuous support of the commission’s effort to advance the status of women throughout Florida. 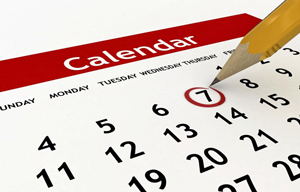 We look forward to the coming year with enthusiasm.